Ron Crocombe (second from right) with his wife Marjorie (far right) at a USP function in Rarotonga. 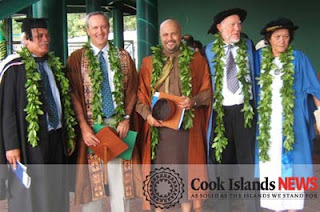 Photo by Cook Islands News. Ronald G Crocombe, professor emeritus, patron of the Cook Islands Library and Museum Society, passed away suddenly on June 18th 2009 at Auckland Airport, on his way home to Rarotonga. Born in Auckland on October 8 1929, Ron was just months away from his 80th birthday. Ron grew up in the small town of Piopio and later attended Otahuhu College in Auckland. Ron obtained a BA from Victoria University; a PhD from Australia National University in the early 1960s. Ron travelled the world before arriving in the Cooks, where he married Marjorie Hosking and had 4 children. Ron had an extensive and successful career as a university professor, writer, lecturer and speaker specialising in the Pacific region. Ron belonged to a generation of scholars that were imbued with the zeal of returning and restoring Pacific peoples to their rightful place in their home and region. This mission meant subordinating his own research interests to a lifetime of cajoling and persuading and ‘coercion’ of Pacific people to research and write their own history and experiences. Ron devoted a lot of time facilitating and coordinating research by Pacific Islanders. The work of about 1700 Pacific Islanders had been brought to fruition and published through IPS (Institute of Pacific Studies) at University of the South Pacific in Fiji. It is impossible to list all those whom Ron mentored throughout his lifetime. Many of his former students became prominent figures in the region: in government and the private sector as politicians, academics, writers, artists and leading business and community leaders. In his 30 years of dedicated service at the USP in Fiji, Ron touched the lives of many students and fellow academics. Many have gone on to become leaders in their respective fields such as Vilisoni Hereniko, Uentabo Neemia-Mackenzie, Howard van Trease, Mere Pulea, Kauraka Kauraka, Morgan Tuimalealiifano, Brij Lal, Marjorie Crocombe, Claire Slatter and many others. Ron’s publication record is monumental. He wrote Land Tenure in the Cook Islands, which has been a standard text for generations of researchers, as has the book The South Pacific (now in its seventh edition). Asia in the Pacific: Replacing the West was his most recent monumental work. Even in retirement, Ron kept busy, always travelling, writing and lecturing. Ron was devoted to the library and museum society, always bringing in books and futurist magazines after every trip away from the Cook Islands. We will remember this amazing man whose spirited generosity and inexhaustible energy kept the Cook Islands Library and Museum supplied for over 40 years with the latest scientific information on health and genetics as well as information on Pacific arts, history and Pacific peoples. In fact many of the books that form the core of our rare books collection have come from the Crocombe’s personal library over the years. Ron will be remembered most of all by the thousands of us whose lives he touched through his teaching and writing on the Pacific and through the kind of person he was – always full of humour and kindness. E puna vai anuanu e putuputu ana te au kukupa. (A cool pond at which the fruit doves gather to drink).